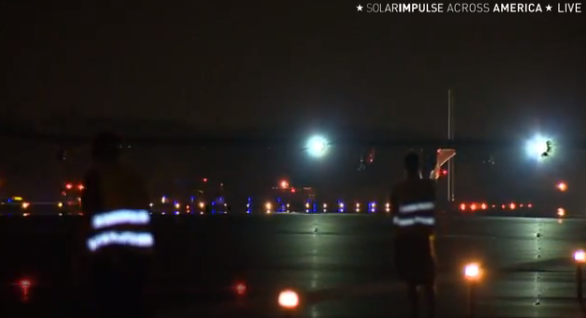 Solar Impulse has successfully hopped its way across the US, completing the final leg of its journey from Washington Dulles International Airport. While today marks the end of the effort at New York's JFK airport as expected, the solar-powered aircraft landed a roughly three hours early -- this, due to an eight-foot tear in its left wing discovered over Toms River, New Jersey. According to the crew, the breakage posed no significant threat to pilot André Borschberg, but it did mean a planned fly-by of the Statue of Liberty had to be nixed. If you'll recall, this was the first US-based trip for Solar Impulse, which the team used largely to raise further awareness about energy efficiency. Aside from that, you can bet some extra publicity can't hurt before a future model is set to make a flight across the world in 2015. Relive Solar Impulse's Across America start at Mountain View, CA here and get more info about the full endeavor at the source link. Livestream wrap-up embedded after the break.